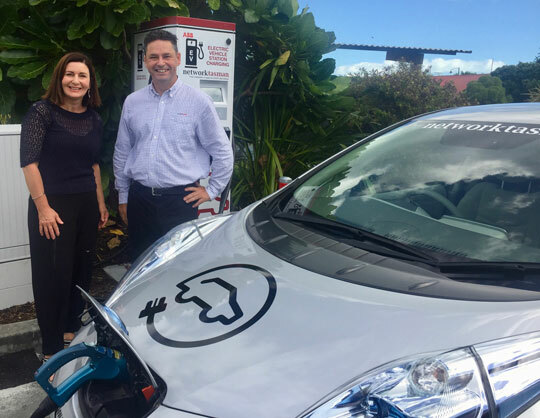 Pictured: Nelson City Council Mayor Rachel Reese and Network Tasman CEO Oliver Kearney at the new fast-charging electric vehicle station in the Millers Acre carpark in central Nelson. Network Tasman marked the opening of its third public Electric Vehicle fast-charging station with Nelson mayor Rachel Reese today (23 January 2017). The charging station is in the Millers Acre carpark adjacent to the Nelson iSite. It was the first of two new Network Tasman fast-charging stations being celebrated this week. A community event in Takaka will mark the launch of the town’s new EV station on Thursday, 26 January from 12pm-2pm next to the iSite in Takaka. “We’ve noticed a great deal of interest in the EV stations we’re installing,” said Network Tasman CEO Oliver Kearney. Network Tasman is installing ABB Terra 53 units, the same as those being installed by Vector, New Zealand’s largest electricity distributor, and WEL Networks in Hamilton. “The ABB Terra 53 fast-chargers can fully charge an electric vehicle’s battery in around 20 minutes,” said Kearney. Network Tasman has added EVs to its own vehicle fleet and believes that interest in adding EVs to company fleets will increase as more road users drive EVs and experience the benefits they bring in terms of environmental impact, on-road cost and reduced driver fatigue. The company will monitor use of its first three EV fast-charging stations with a view to installing more charging stations in other locations within Nelson/Tasman. Network Tasman’s lines charges will decrease from 1 April 2019. This is good news for almost all consumers as it means the average residential customer’s lines charge will fall by $3.50 per month (including GST). Electric vehicles are attracting a lot of interest in our region and it's great to see the community using the charging stations Network Tasman has installed. Two new stations to fill up your car are being built in the region but there won’t be a drop of fuel in sight. Rather than the traditional petrol and diesel pumps, the two stations in Takaka and Nelson will be pumping energy.